The Dubai World Cup is a for group 3 to group 1 race meeting for 4yo+ Northern Hemisphere Thoroughbreds and 3yo+ Southern Hemisphere Thoroughbreds which is held in Dubai every year at the end of March and attracts the world’s finest Thoroughbred horses. The Dubai World Cup is considered to be the world’s richest horse race meeting with a purse of more than $26 million awarded to the winners. The Dubai World Cup meeting holds eight different races, when the most significant among them is the Dubai World Cup race, am Emirates Airline sponsored race featuring a 1m 2furlong run over dirt course with a purse of $10 million. The Dubai World Cup was founded by Sheikh Mohammed bin Rashid Al Maktoum, UAE Vice President, Prime Minister and Ruler of Dubai. As a horse lover and horse racing enthusiast, Sheikh Mohammed aspired to pay tribute to the world of horse racing and to place Dubai on the map of international horse racing by establishing a race meeting for the elite group of Thoroughbred horses from all over the world, with horses from the US, UK, NZ, Japan, Australia and France running the meeting. 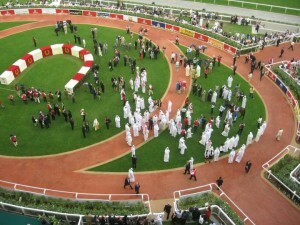 The first race was run in 1996 at Nad Al-Sheba racecourse which hosted the Dubai World Cup for the last two decades. 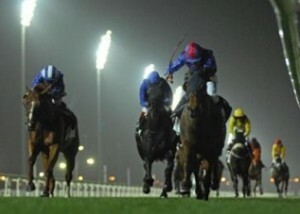 The race is now being run at Meydan racecourse, which was erected in the course of the past years and has recently been inaugurated to host the 2010 Dubai World Cup, with an intention to annually host the meeting at this racecourse as of March 2010. The Dubai World Cup meeting is currently hosting 8 races designated for group 3 to group 1 Thoroughbreds and is run over turf or tapeta which is an artificial grass surface. The Meeting is held at the end of March each year over a course of one day and is being visited by more than 50,000 racegoers who also grab the chance to tour Dubai while not attending the races. The Dubai World Cup meeting is now considered to be within the same category of other major horse racing events like the Breeder’s Cup, the Melbourne Cup and the Kentucky Derby, as a top class horse racing meeting with the best Thoroughbreds running state of the art tracks at the new and prestigious Meydan racecourse. Attending the Dubai World Cup is considered to be a luxury only a few can afford. It is an exciting gathering of horse racing enthusiasts, top class trainers and jockeys and top class Thoroughbred horses with betting activity which exceeds beyond regular daily horse racing betting.